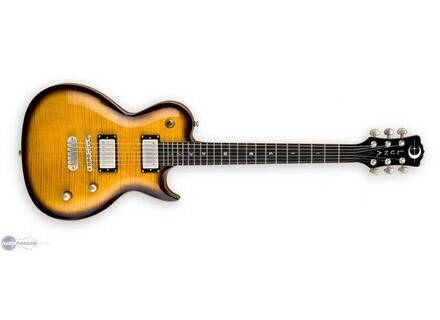 Apollo, LP-Shaped Guitar from Luna Guitars. Luna Guitars has launched the apollo, an electric guitar named after the... Greek and Roman god of light, truth, medicine and music (...what else?). According to Luna, the versatile 25 ½" scale Apollo guitars feature an Eastern mahogany body with a flame maple top, a set mahogany "V" neck with ebony fingerboard as well as dual humbucking pickups and matte nickel hardware. The Apollo guitar is available in Trans Black Burst, Trans Brazilian Burst and Trans Purple Burst finishes. ProTone announces J.Becker Distortion Pro Tone has announced the development of a dual channel distortion pedal in collaboration with guitarist Jason Becker. V-Picks presents V-Slide Guitar Slide Vinni Smith's V-Picks presents the V-Slide, a guitar slide made of the same material as the brand's guitar picks. The Alternative (and so on) phone home The Alternative Guitar and Amplifier Company presents the Alien, a guitar with a shape that indeed seems to have come from another world.